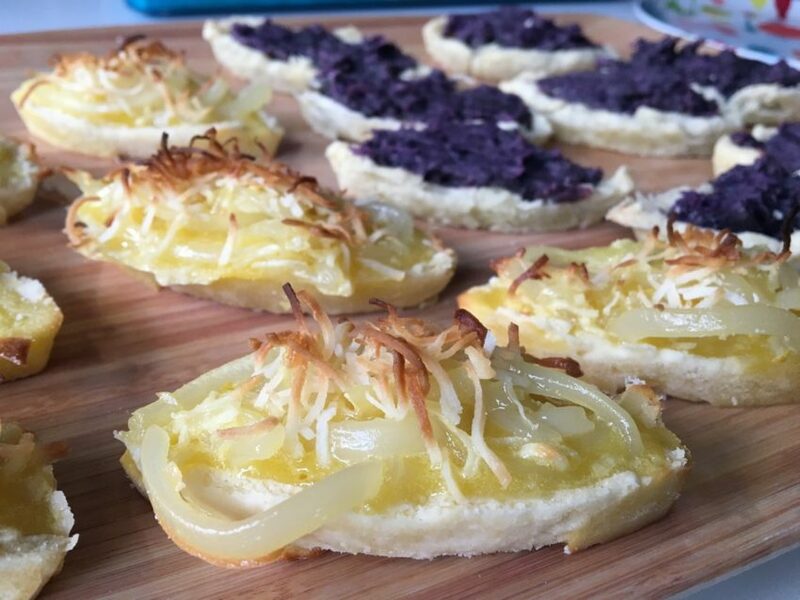 I wanted to see if I could improve on the standard boat tarts you find at most Filipino bakeries. These come in lots of fun flavors, typically in a brightly colored cellophane wrapping. 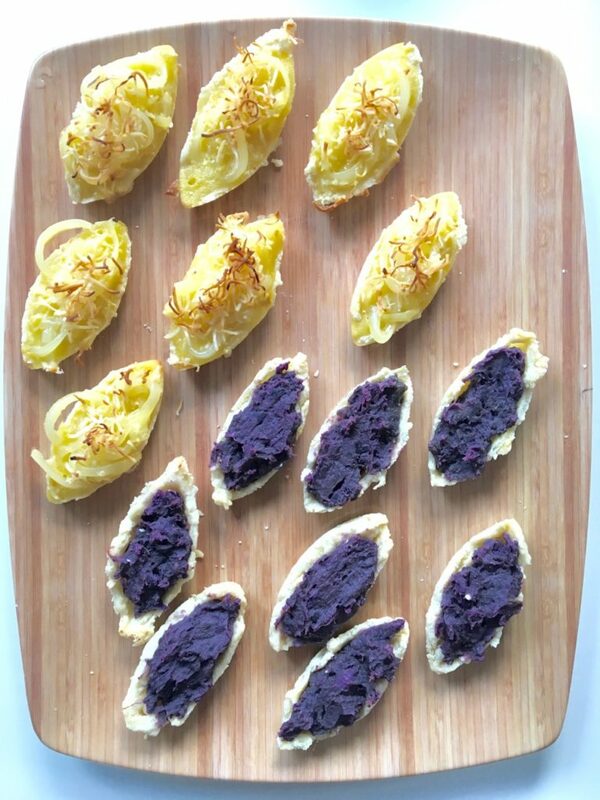 Here’s my version of two of my favorite flavors of boat tarts: macapuno (coconut strands) and ube (purple yam.) It’s super easy and takes just a couple of hours (including time for the dough to rest and baking time). This recipe makes about 18 boat tarts, using this silicone mold I found at NY Cake. The mold works great, even though traditionally they are made in individual tin molds. Those are impossible get in the States apparently. Blend flour, salt and butter till they resemble coarse crumbs. Add the egg yolk. Incorporate and knead well. Add cold water, as needed to bind crust together. Wrap in plastic and refrigerate for at least an hour. On a floured board, roll out the pastry dough. Cut out a small piece of dough and place it carefully into boat-shaped tart mold. Place the mold on a large flat baking sheet. Bake in the oven at 350 F for 15 minutes. Take out of the oven and set aside while preparing the filling. In a bowl, beat egg yolks and sugar together. Add melted butter, macapuno, shredded coconut, lemon zest and 3 tablespoons flour. Stir well until ingredients are combined. Fill the boat tart crusts with macapuno filling. Put a bit more shredded coconut on top to add some color. Bake at 375 degrees for 15 minutes. 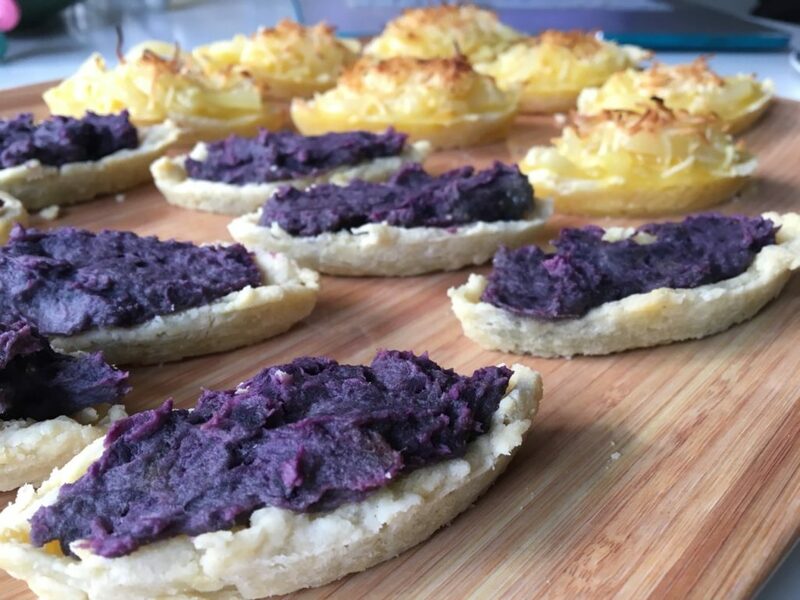 Let tarts cool before removing from mold. Peel and cube ube until you have a little more than 1 1/2 cups worth. Steam the ube for about 15 minutes until soft. Mash with a fork and set aside. Cream butter and sugar in a large bowl, add the eggs and combine. Add the cream and mashed ube and combine ingredients until smooth. Spoon filling into the boat tart molds and set it on top of a baking sheet. Bake in the preheated oven at 350 for 15 minutes. Let tarts cool before removing from mold.